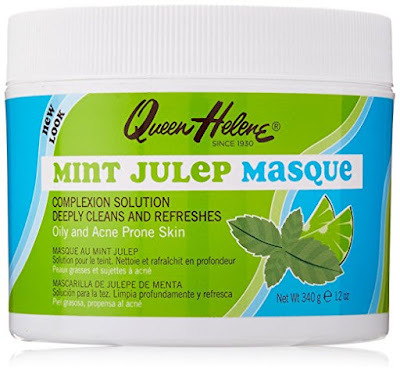 A few months back, one of my friends gave me a mask called Queen Helene Mint Julep Masque. And I must admit that it is simply fabulous and is extremely effective on my oily, acne-prone skin. Designed to dry up acne/pimples, scrub off blackheads and shrink enlarged pores, it certainly lives up to its claims. It has a strong mint smell, which you may find rather pleasing, if you love minty fragrances. And when you apply it to your clean face and neck, at first you experience a cooling sensation and then a slight stinging feeling which disappears as the masque firms and hardens to draw impurities from your pores. Even if your oily/combination skin does not break out and is otherwise problem-free, this masque is still great for you as it also acts as a refreshing ‘facial’, making your face feel very tight, thus relaxing your tired muscles and easing tension lines on the face and neck. You can then wash it off using a warm wash cloth and your skin is left feeling fresh and clean which is maintained for a couple of days. I’ve used this mask 4 times in a month (more than that can be too drying on your skin) and it does an excellent job of absorbing oil and drying out pimples. Just like aspirin, this can also be used as spot treatment on pimples by leaving it overnight; so when you wake up in the morning you can see that those stubborn acne spots have dried up. Though I am pleased with this product's performance, I feel that it might be harsh on dry or sensitive skin if overused; once in 45 days would be just fine. what is the best way to prevent pimples and maintain a fair complexion for sensitive skin people? Wash your face with besan powder. Add some water to besan powder to make a thin paste. Scrub this mixture for 2 mins and wash your face with water. My brother suggested I might like this internet site. He was entirely appropriate. This post really produced my day. You'll be able to not imagine just how much time I had spent for this info! Thanks!